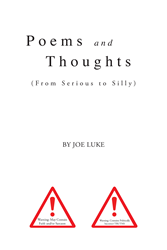 Recent release “Poems and Thoughts” from Page Publishing author Joe Luke is both enlightening and entertaining; this compilation of poems will keep the reader intrigued through the various emotions and ideas. Joe Luke, a poet and devoted writer and author, has completed his new work, “Poems and Thoughts”: a gripping and potent work that explores the ideas of life, love, laughter and loss. Published by New York City-based Page Publishing, Joe Luke’s poignant tale will keep the reader mesmerized through the rhythmic, enlightening poems. “With so much unbelievable stuff going on in this world, I couldn’t be silent any longer,” said author Joe Luke when explaining why he wrote his latest work, Poems and Thoughts. Readers who wish to experience this profound work can purchase “Poems and Thoughts” at bookstores everywhere, or online at the Apple iTunes store, Amazon, Google Play or Barnes and Noble.